Published by Comunica, Diversifying Participation in Network Development is the final report of the World Dialogue on Regulation (WDR) 3rd research cycle. Edited by Amy Mahan and William H. Melody, this most recent collection of the network’s research and case studies elaborates on inclusive and propoor strategies for extending network development. The radio/telecommunications combination is helping to keep communities together, despite the distances imposed by migration. 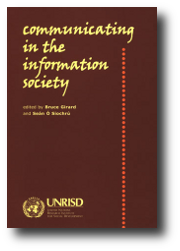 The cases presented in this book are among the first examples of the convergence of radio and new ICTs for development, and the book underscores the significant potential of the combination. In this convergence, radio promises to take on even greater significance and value. For this reason, we believe that radio is the one to watch. 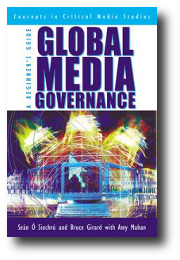 This book is about media and communication governance at a global level and its key influencing forces, organizations and elements. Questions addressed here include: Why do we regulate the media? What are the major forms of global regulation, and how do they work? Who participates in, and who benefits from, media governance structures? What are the trends?